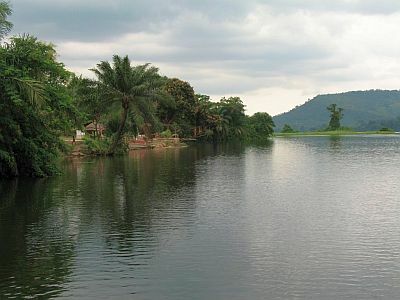 In Ghana, the climate is tropical, with a dry season in winter and a rainy season in summer due to the African monsoon. The rainy season lasts from May to September in the north, from April to October in the center, and from April to November in the south. On the contrary, along the east coast, the rainy season is shorter and goes from April to June, with a break in July and August, and a slight recovery in September and October. The rainiest area is the south, where precipitation is above 1,500 millimeters (60 inches) per year, and even more so the small west coast area, where it reaches 2,000 mm (80 in) per year. 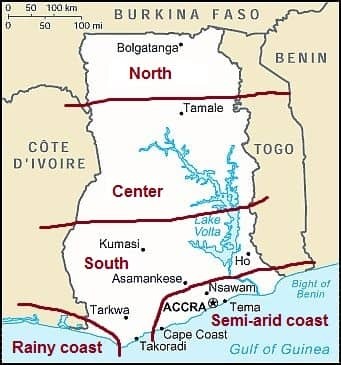 The driest areas are the north, where the rainfall amounts to around 1,000 mm (40 in) per year, and the eastern coast, which includes Accra, where it drops below 800 mm (31.5 in). Anyway, as we have said, in the north, there's only one rainy season, which reaches its peak in the summer months, while on the coast, the rainy season is divided into two. In the following image, we can see the climatic zones of Ghana. In the center and north, winter is hot: daytime temperatures are usually about 35 °C (95 °F) in December and January, even though the air is dry and nights are quite cool. Sometimes, however, nights can get a bit cold in the center-north, with lows dropping to around 10 °C (50 °F). A dry, dust-laden wind, called Harmattan, often blows from the desert. From February to April, the temperature increases further, easily exceeding 40 °C (104 °F). Here are the average temperatures of Bolgatanga, in the far north. Then comes the monsoon. In March in the center and in April in the north, early showers and thunderstorms may occur, usually in the afternoon or evening, which become more substantial, exceeding 100 mm (4 in) per month in the following month (ie April in the center and May in the north). Owing to thunderstorms and clouds brought by the ocean currents, the temperature gradually decreases, and from July to September, when clouds and rains are more frequent, it drops to around 30/31 °C (86/88 °F), but on the other hand, air humidity increases. The rains cease in October in the north and in November the center; with the dry wind from the north, hot and sunny conditions return. At the end of the year, rainfall totals 1,000 mm (40 in) in the north and 1,200/1,300 mm (47/51 in) in the center, where, as previously mentioned, the rainy season is longer. Here is the average precipitation in Tamalé, located in the north-central. The sun in the center-north shines all year round, except in the rainy period, when the sky is often cloudy (in the far north, the sun shines a little more often). Here are the average sunshine hours per day in Tamalé. In the south, the winter is a bit less hot, in fact, the daytime temperatures are about 31/32 °C (88/90 °F) in December and January and reach 34 °C (93 °F) in February. Here, there is almost no warming in spring because the rains begin as early as in March. Here are the average temperatures of Kumasi, located in the south. The rainiest month is June, with 225 mm (9 in); from mid-July to mid-September, the rains decrease a bit, and then they resume from mid-September to early November. In the south, rainfall reaches 1,400/1,500 mm (55/60 in) per year, and even more in some areas to the east of Lake Volta and to the south-west of Kumasi. Here is the average precipitation in Kumasi. In the south, the sun does not shine very often; in fact, even in the short dry period, a bit of cloudiness can form, while from July to September, the sky is normally cloudy. Along the east coast, where Accra, the capital, is located, the climate is a bit different, although the winter is similar to that of the rest of the south, that is, less hot but more humid than the north. Sometimes, however, the dry Harmattan can arrive even here. Here are the average temperatures of Accra. In spring, the rains arrive earlier, with the first showers already in March, and a peak in June, when precipitation reaches 200 mm (8 in) per month. But later, because the so-called "Intertropical Convergence Zone" moves to the north, the rainfall decreases sharply, so much so that just 10 mm (0.4 in) of rain fall in August. Nevertheless, from June to September, the sky remains usually cloudy. On the coast, as well as in the rest of the country, the summer months are the least hot of the year, though the humidity is high, actually, it is even higher than in inland areas because of the proximity to the sea; on the other hand, the sea breeze blows, reducing the feeling of stuffiness. In September and October, the rains increase again, but they do not reach 100 mm (4 in) per month. In Accra, only 790 mm (31 in) of rain fall per year, and basically, the only very rainy months are May and June, and sometimes, the first half of July. Here is the average precipitation in Accra. In summer, the sky in Accra is often cloudy even in the period when rainfall decreases, from July to September. The sea in Ghana is warm enough for swimming all year round, even though the water temperature decreases a little from July to September. Along the west coast, the rains are much more abundant, and from May to mid-July, they become really heavy, reaching up to 500 mm (20 in) per month; the summer break is evident here as well, and runs from mid-July to mid-September, but then the rains return substantial, although they do not reach the peaks of the first part of the rainy season. The rains linger until December, so the only relatively dry months here are January and February, in addition to August. In this area, the rainfall can reach 2,000 mm (80 in) per year. Here is the average precipitation in Axim. 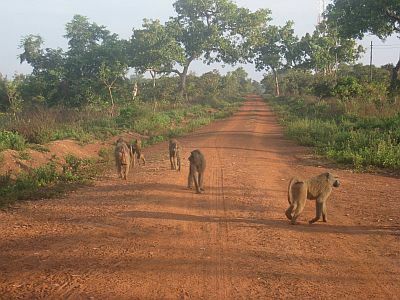 The best time to visit Ghana is generally the winter, from December to February, since it is the driest and sunniest period of the year: the weather is generally good, although it's hot during the day in the center-north. In the north, the best time is from November to January because in February it gets even hotter. In November, the last rains occur in the south, and even in December on the west coast. So, the best month to visit Ghana as a whole is January. In winter: in Accra and the coast, bring light clothes for the day, a light sweatshirt for the evening, and a scarf for the wind-borne sand and dust. In the north, bring light clothing, a sweatshirt and a light jacket for the evening, and a scarf for the desert wind. In summer: bring tropics-friendly, light clothing of natural fibers, an umbrella, a light sweatshirt and a light raincoat for the rain showers.